I’m out of town this weekend indulging in a very non-stats related hobby: pro wrestling. Those of you who follow such things will know that this is WrestleMania weekend and it’s in New Jersey/just outside of NYC this year, and just so happens to coincide with my husbands birthday. Convenient. Given the throngs of wrestling fans converging on one spot, there were quite a few other shows put on by other groups looking to capitalize on the crowds. One such show was a New Japan pro wrestling/Ring of Honor joint venture held last night at Madison Square Garden. We went to this one, and I was interested to note it had one of the more lopsided gender ratios of any event I’ve been to. I’ve mentioned previously that I have a habit of counting such things, and last night was no exception. Normally I like to estimate the ratio of mono-gender groups, but despite all my looking I never found a women only group at this event. I ended up switching to the number of women I could see in each row – rows were about 15 to 20 seats each. Rows almost always had 2 to 3 women in them. I never found a row with 4 women. I’d estimate the ratio at 7 to 1 male to female. There were more women in the expensive seats than the cheap seats. I’d never explicitly noted uneven distribution of gender before, but I’ll watch for it from now on. The gender ratio changed as the place filled up. When we first got there it was probably closer to 10 to 1, but more women showed up the later it got. Men with long hair were a major confounder. When I count rows from far away I’m mostly looking at hair first, but I had to proceed slowly here. Obviously those first two bullet points emphasize that this is a male dominated fandom, which I’m sure is not surprising to anyone. This was not a show aimed at the more popular or mainstream fan, but the “willing to tolerate half the show being announced in Japanese” type fan. Tonight I expect the gender ratio to be more even, as WrestleMania has a broader spectrum of appeal and their women’s division is currently on FIRE. I’ll report back with my estimate tomorrow. Go Becky Lynch! Update: The gender ratio at Wrestlemania ended up being about 4 or 5 to 1 male:female. Interestingly, the “extra” women were almost entirely younger girls, mostly there with their dad. One ahead of us walking in was even fully in costume (as Bailey), carrying a replica title belt and started trying to lead the “Woooooooooooo” cheer on the escalator. I think the strategy of pumping up their women’s division is paying off. Today’s addition to the GPD Lexicon is made in honor of my Dad. It will come as no surprise to anyone that after years of keeping up this blog, people now have a tendency to seek me out when they have heard a particularly irritating statistic or reference during the week. This week it was my Dad, who heard a rather famous columnist (Liz Bruenig) mention on a podcast that “even conservative New Hampshire is considering getting rid of the death penalty”. He wasn’t irritated at the assertion that NH is looking to get rid of the death penalty (they are), but rather the assertion that NH was representative of a “conservative state”. You see while NH certainly has a strong Republican presence, it is most famous for being a swing state and has actually gone for Democrats in every presidential election since 1992, except for the year 2000. Currently their Congressional delegation is 4 Democrats. Their state legislature is Democrat controlled. Slightly more people (3%) identify as Democrat or lean that way than Republican. The Governor is a Republican, and it is definitely the most conservative state in New England, but calling it a conservative state on a national level is pretty untrue. Gallup puts it at “average” at best. What struck me as interesting about this is that New Hampshire actually did used to be more conservative. From 1948 to 1988, a Democrat only won the Presidential election there once. From 1900 to 2000, the Governor was Republican for 84 out years out of the century. In other words, it wasn’t a swing state until around 1992 (per Wiki). Broken Record Statistic: A statistic or characterization that was once true, but is continuously repeated even after the numbers behind it have moved on. In the course of looking this up btw, I found another possible broken record statistic. If you ask anyone from New Hampshire about the blue shift in the state, they will almost all say it’s because people from Massachusetts are moving up and turning the state more blue. However, the Wiki page I quoted above had this to say “A 2006 University of New Hampshire survey found that New Hampshire residents who had moved to the state from Massachusetts were mostly Republican. The influx of new Republican voters from Massachusetts has resulted in Republican strongholds in the Boston exurban border towns of Hillsborough and Rockingham counties, while other areas have become increasingly Democratic. The study indicated that immigrants from states other than Massachusetts tended to lean Democrat.” The source linked was a Union Leader article (“Hey, don’t blame it on Massachusetts!”) name but no link. Googling showed me nothing. However, the town by town maps do indicate that NH is mostly Republican at the border. Does anyone know where these numbers are coming from or the UNH study referenced? 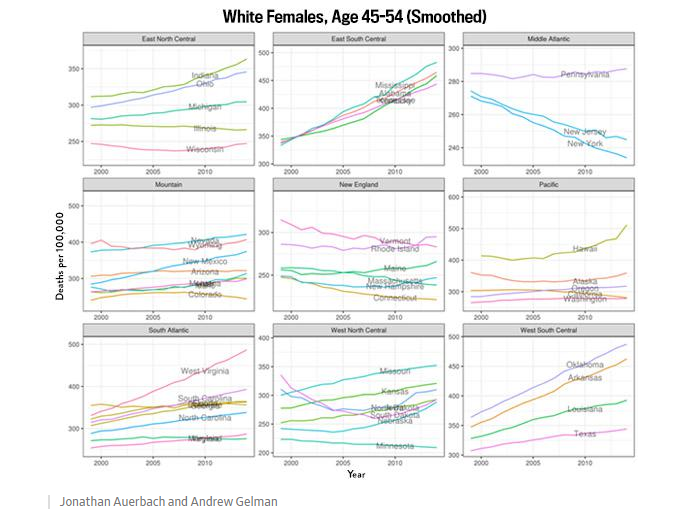 A couple of years ago now, there was a lot of hubbub around a paper about mortality rates among white Americans. This paper purported to show that mortality for middle aged white people in the US were not decreasing (like other countries/races/ethnicities) were, but was actually increasing. In other words, there are trends happening, but they’re complicated and not easy to generalize. One of the big questions that came up when this work was originally discussed was how much “despair deaths” like the opioid overdoses or suicide rates were driving this change. Now, there appears to be a new paper coming out that shows there may be elevated mortality in even earlier age groups. It appears only the abstract is up at the moment, but the initial reporting shows that there may be some increase in Gen X (current 38-45 year olds) and some Gen Y (27-37 year olds). They have reportedly found elevated mortality patterns among white men and women in that age group, being partially driven by drug overdoses and alcohol poisonings. 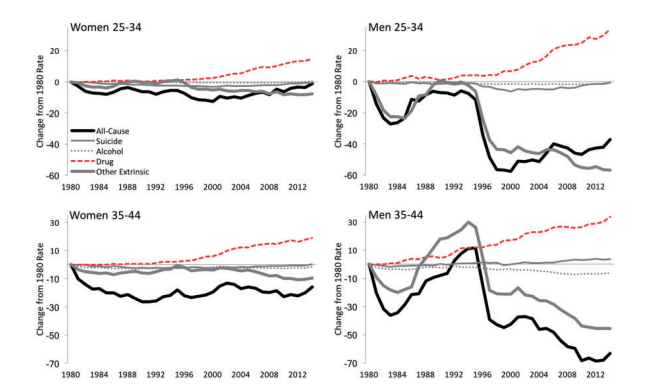 Non-Hispanic White males: Baby Boomers, late-Gen Xers, and early-Gen Yers. Baby Boomers: drug poisoning, suicide, external causes, chronic obstructive pulmonary disease and HIV/AIDS for all race and gender groups affected. Late-Gen Xers and early-Gen Yers: are at least partially driven by mortality related to drug poisonings and alcohol-related diseases for non-Hispanic Whites. Differential patterns of drug poisoning-related mortality play an important role in the racial/ethnic disparities in these mortality patterns. We are undergoing a massive inspection at work tomorrow (gulp) and have been swamped preparing for it. Any thoughts or prayers for this welcome. I live in a state where most of the races are pretty lopsided. For point #2, we have Democratic Senator Elizabeth Warren currently up by 22 points, and Republican Governor Charlie Baker currently up by almost 40 points. My rep for the House of Representatives is running unopposed. The most interesting race in our state was actually two Democrats with major streets/bridges named after their families duking it out, but that got settled during the primaries. I’ll vote anyway because I actually have strong feelings about some of our ballot questions, but most of our races are the very definition of “my vote doesn’t make a difference”. However, I still think there are interesting reasons to vote even if your own personal vote counts minimally. In an age of increasing market segmentation and use of voter files, the demographics that show they consistently vote will always be more catered to by politicians. I mentioned this a while ago in my post about college educated white women. As a group they are only 10% of the voting public, but they are one of the demographics most likely to actually vote, and thus they get more attention than others. There are race based differences as well. Black voters and white voters vote at similar rates, but Hispanic and Asian voters vote less often. Additionally, those with more education and those who are richer tend to vote more often. While that last link mentions that it’s not clear that extra voters would change election results, I still think it’s likely that if some groups with low turnout turned in to groups with high turnout, we may see some changes in messaging. While this may be mixed for some people who don’t tend to vote with their demographic, it does seem like getting on the electoral radar is probably a good thing. I was away for most of this week so I’m just getting to this now, but Brian Wansink has announced he’s retiring at the end of this academic year after a series of investigations in to his work. I’ve blogged about the Wansink saga previously (also here and here and here) , and have even had to update old posts to remove research of his that I referenced. Christopher B passed along a good summary article from the AP , which I was pleased to see included a note that they had frequently used him as a source for stories. The New York Times followed suit, and this article mentions that he was cited as a source in at least 60 articles since 1993. While the initial coverage was mostly shock, I’ve been pleased to see how many subsequent articles point to the many bigger problems in science (and science reporting) that led to Wansink’s rise. The New York Times article I just cited delves in to the statistical games that the field of nutrition often plays to get significant results, and how the press generally reports them uncritically. For those of you who have been following this story, you’ll remember that this whole drama was kicked off by a blog post Wansink wrote where he praised a grad student for finding publishable results in a data set he admitted looked like it had yielded nothing. While this wouldn’t be a problem if he had admitted that’s what he was doing, his papers never corrected for multiple comparisons or clarified that they were running hundreds of different comparisons to try to find something significant. The Atlantic put up a good piece about the “scientist as celebrity” angle, discussing how we should think about scientists who get a lot of attention for their work. The “buzz cycle”, where we push findings we like and scientists respond by trying to generate findings that will be likable. 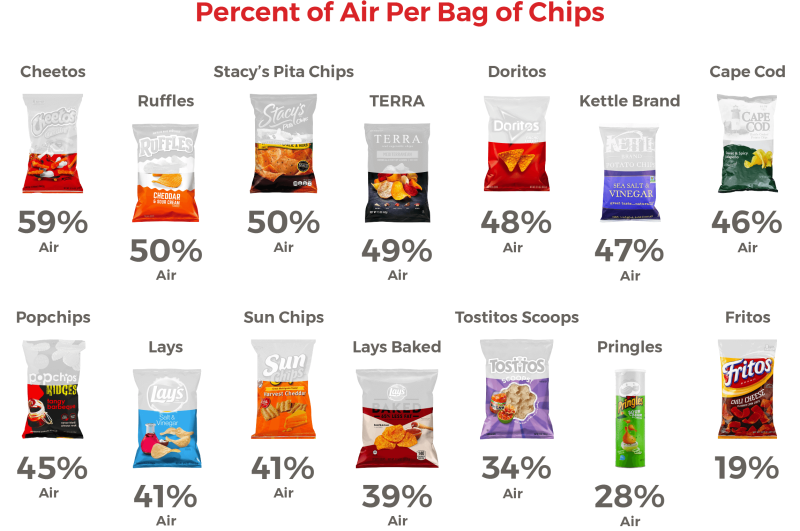 This is a good point, as many people who don’t know Wansink’s name know of his findings (health halos, use small plates, we eat more from bottomless soup bowls, etc). This Washington Post op-ed has an interesting discussion of science education, and wonders if we did more to educate kids about scientific mistakes and fraud if we’d be more skeptical about scientific findings in general. It’s an interesting thought…we do hear science mostly presented as an unbroken march towards truth, not always hearing how many side roads there are along the way. Overall it’s a fascinating and sad story, made slightly worse by the fact that it appears to have come to a head at the same time that Wansink’s mother died and his father broke his hip. While this is a good reminder to limit any gratuitous potshots against him as a person, it still raises many interesting discussion points about how we got here. Any other articles, feel free to pass them along! Please note: I am in no way affiliated with any of these apps. I just got them recently and have been using them, and thought they were fairly interesting for people who like to think about data or in a systematic fashion. In other words, I get no money for this. One of the lovelier parts of living in 2018 is the ability to Google solutions to any problem. Recently I’ve been doing a lot of poking around for apps that might keep me organized in a few different areas, and these are some good ones I’ve found. To the shock of no one, all of them are pretty checklist or data driven. Since I suspect many readers of this blog probably think similarly to me, I thought I’d throw the suggestions out there just in case they would be helpful to others. While I have no idea how to pronounce the title of the Tody app, I love how it works. 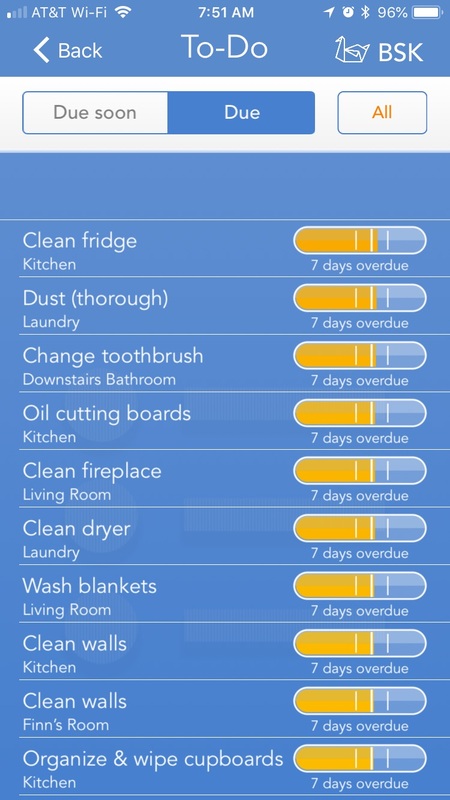 Basically, you select a list of rooms you have in your house, then the app recommends various cleaning activities that should be done for each. You add the ones that make sense to your list, set what type of cleaner you are (relaxed, standard or proactive) and it generates a list for you of what you should be doing. Note: I downloaded the app 7 days ago, and set a bunch of things up as “due” which is why they are all identical. Anyway, I like this because if I have a few minutes to clean, this helps me spread out my efforts. I generally fall in to a bit of a pattern with cleaning, hitting some things frequently and other things only when I think “oh gosh, that looks really gross”. Once you check something off it goes to the back of the line, but then reminds you again once it comes due. You can do this for both cleaning tasks and various “replace” type tasks. As you can see, it suggested I set a reminder for changing my toothbrush (I go to the dentist on Monday) and I have it set up for my water filter as well. My favorite part though is that you can create a family account. Both my husband and I downloaded it, and we now share the list. We haven’t used it, but you can also assign tasks to people, and compare effort. I’d imagine this would be good for assigning chores to kids. There’s a couple other fun features: you can see which room collectively needs the most attention, you can sort by room, you can add your own tasks with frequency as you think of them, and you can add outdoor or car related things as well. Pretty fun, and good for those of us who have no memory/sense of when housework should be done and instead are just sort of careening. Also, you can run reports and checking a box is just satisfying. Good stuff. Price-wise, it’s a one time cost of $6.99 for each person who downloads it. I’m still playing with this one, but Freeletics seems pretty fun. It’s a workout app (mostly high intensity interval workouts) that uses an AI coach to give you a personalized workout plan. Every week you record how you did on the previous workouts and how much time you have next week, and it generates you a new plan. While this seems kind of basic, it’s actually nice not to have to put any thought in to it. I think using your own basic data (I have limited free time this week, last week’s workouts were too easy) to drive what should be assigned is nice and a good use of feedback loops. It ensures you’re taking a break when needed, and pushing when you can. The subscription price is a little high: $35 for 3 months. However, paying that price gives you access to three different apps: the running one, the bodyweight workouts one, and a gym program. I look forward to playing with this more often. I don’t really like apps that give you a meal plan, but I do get a kick out of checklists. Dr Michael Greger’s Daily Dozen Checklist is based on the book “How Not to Die” by Michael Greger, and lets you check off each serving of the recommended foods you’ve had that day. The only issues with this one is that Dr Greger is vegan based, so it’s probably not fun for anyone who’s not in to that. Overall: I think the number one thing I’m getting out of these apps is a lot of data about what a creature of habit I am. I clean the same few things over and over, am at a loss for how to adjust when my workouts don’t go according to plan, and focus on the same few healthy foods. Having somewhere to track what I’m focusing on and (by default) point out what I may be missing is helpful. If anyone has any other apps they like, I’d be interested in hearing them! Well it’s summer and we’ve had one heck of a heat wave up here, with humidity that I heard dubbed “sweatpants heat”. It’s gross. I’m particularly miserable about the whole thing because I’ve caught a terrible cold, which does not play well with the heat/humidity. I was thinking about the unique pain that summer colds bring, and decided to Google around to see if there was any research on this. Turns out there is! It appears that summer colds are actually caused by different viruses than winter colds, so the feeling that they’re a little different is a real one. The Assistant Village Idiot did an interesting post about media bias, in the form of compiling Time and Newsweek covers of Presidents from Ford on. A quick look gives you a feel of how each President was portrayed. I previously might have argued that magazine covers didn’t effect me that much, but ever since I found out that I thought Billy Graham died years before he did (probably) because of a TV Guide cover I’ve been less confident about this. Donna B raises a good question in the comments about the covers given to those who ran for the presidency but lost during those years. Some surprisingly bad news: a huge randomized control trial of state sponsored pre-K shows the positive effect is only present at the end of the pre-K year, and turns negative by 3rd grade with kids who went to free pre-K performing worse in math and science than their peers who stayed home. This is surprising as I thought the worst case scenario would be “no effect”. The study authors have two theories for the results. First, it’s possible some kids just do better at home. Second and not unrelated, they note that more of the kids in the pre-K program ended up in special needs classes (remember, they were randomly assigned to pre-K vs home) and they wonder if some slower to develop kids got inappropriately tagged as special needs. It appears this early designation then followed them and they may have eventually held back beyond what was needed. Still a good data point in the “not everything that sounds like a good idea is one” train of thought. I’ve been thinking a lot about viruses and other various pathogens recently, and the theories that they impact chronic disease more than we realize at the moment. For example, a recent Harvard study suggests that the herpes virus may help precipitate Alzheimer’s Disease. Celiac disease may be triggered by a candida infection. Some strains of intestinal bacteria may make it really hard for people to lose weight. The mechanisms for this are interesting and varied. The Alzheimer’s theory hinges on the idea that amyloid-B (the thing that ends up clogging up the neurons in Alzheimers patients) is produced to try to fight off HHV-6 and HSV-1, but something gets out of control and it takes over. Candida and gluten apparently bind to the same site on the walls of the intestines, so the theory is the body starts trying to fight off candida but produces antibodies to everything binding at that site. Gut bacteria that thrives on sugar or other “bad” treats might release toxins when you stop eating it that make you feel miserable until you resume previous eating patterns. One statement I read somewhere while reading this stuff stuck with me “maybe our pathogens didn’t go away when we invented antibiotics and vaccines, maybe they just got less deadly and more subtle”. I’m completely fascinated by these theories, though we’ll see if they pan out.